Estadio Antonio Vespucio Liberti (Spanish pronunciation: [eˈstaðjo monumenˈtal anˈtonjo βesˈputʃo liˈβerti]), also referred to as River Plate Stadium or simply El Monumental, is a stadium in the Núñez district of Buenos Aires, Argentina, home of the football club River Plate. It was opened on 25 May 1938 and named after former club president Antonio Vespucio Liberti. 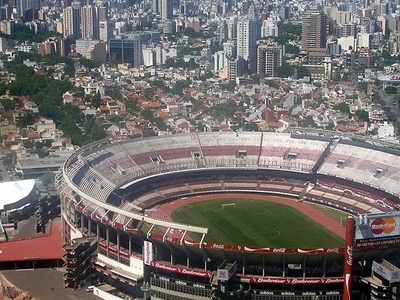 It is the largest stadium in Argentina with a capacity of 67,664 and also home of the Argentina national football team. 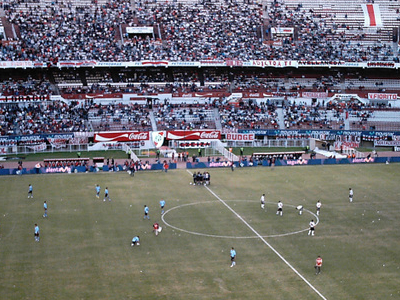 It was a venue in the 1978 FIFA World Cup and hosted the final between Argentina and the Netherlands. Additionally, it hosted four finals of the Copa América, most recently in 2011 for the 2011 Copa América. Is the official stadium of Argentina national football team (Spanish: Selección de fútbol de Argentina). In 2018, the stadium will host the Opening and Closing ceremonies of 2018 Summer Youth Olympics in Buenos Aires. Here's the our members favorite photos of "Stadiums in Buenos Aires". Upload your photo of Estadio Monumental Antonio Vespucio Liberti! Get in touch with 2 Touristlink members who want to visit Estadio Monumental Antonio Vespucio Liberti or with Diego Correa and Bertrand who already have been here.